Output-sensitive data structures result from preprocessing n items and are capable of reporting the items satisfying an on-line query in O(t(n) + ℓ) time, where t(n) is the cost of traversing the structure and ℓ ≤ n is the number of reported items satisfying the query. 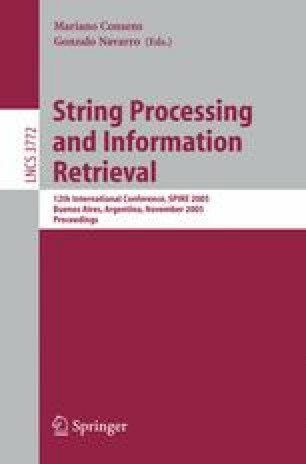 In this paper we focus on rank-sensitive data structures, which are additionally given a ranking of the n items, so that just the top k best-ranking items should be reported at query time, sorted in rank order, at a cost of O(t(n) + k) time. Note that k is part of the query as a parameter under the control of the user (as opposed to ℓ which is query-dependent). We explore the problem of adding rank-sensitivity to data structures such as suffix trees or range trees, where the ℓ items satisfying the query form O(polylog(n)) intervals of consecutive entries from which we choose the top k best-ranking ones. Letting s(n) be the number of items (including their copies) stored in the original data structures, we increase the space by an additional term of O(s(n) lg ε n) memory words of space, each of O(lg n) bits, for any positive constant ε < 1. We allow for changing the ranking on the fly during the lifetime of the data structures, with ranking values in 0 ... O(n). In this case, query time becomes O(t(n) + k) plus O(lg n/ lg lg n) per interval; each change in the ranking and each insertion/deletion of an item takes O(lg n); the additional term in space occupancy increases to O(s(n) lg n/ lg lg n).